Save AED 400 (40.04%) – Earn 57 Shukrans What is Shukran? Shukran is the Landmark Group’s award-winning loyalty programme in the Middle East, which allows you to earn Shukrans when you shop any of our brands. 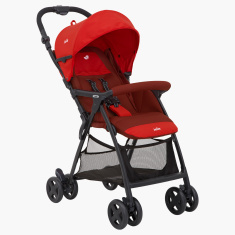 Designed with perfection, this stroller is an excellent purchase for you and your baby. The canopy adds to the efficiency of this stroller. The multi-position recycling system offers comfort to your growing child. Being foldable, this stroller promises convenience of storage when not in use.